Training your employees is an inevitable task in your organization. You have to keep up with industry standards, onboard new hires, demonstrate how to use the coffee machine… the list goes on. All of these are critical parts of your organization's relationship with your employees and they have individual, powerful perks. But, many businesses aren’t aware of the importance of training employees. We’ve seen first-hand what training employees can do for businesses. And it’s not just the business that reaps the rewards from training, your employees do too. To fully understand how to deliver great training, it’s vital to know why training is important for employees. The prime motivator for employee training is to improve performance. And when executed well, it does just that. It provides your employees with the expertise they need to fulfill their role and make an impact on your business. The skills they learn empower them to deliver a better quality of work. It also gives your hires a clear understanding of their role and responsibilities in your organization. They know their targets and they're equipped with the tools to effectively meet them. Engaged employees have an increased level of productivity - it’s as simple as that! Through training, you're continuously engaging your employees and enabling them to engage back. There is two-way communication, opinions and internal workings shared. Your employees are also being kept up to date with what’s going on. This makes them more emotionally invested. They care about their role and are more willing to commit their time and energy to the company. It's common knowledge that the hiring and onboarding process can be a costly and time-consuming task. And a powerful by-product of increased performance and engagement through training is improved employee retention. Training boosts a feeling of value in employees. It shows that you’re committed to providing them with the resources needed to ensure they’re doing a good job. In turn, they are more likely to enjoy their work and remain in your organization for longer. It also nurtures them further in their career within your organization. You’ll have more opportunities to hire from within, reducing hiring and onboarding costs for your business. Creating consistency within an organization is difficult. But training helps reduce a disparity between your teams. Each employee has a baseline knowledge of their own and their team’s goals putting everyone on the same page. Employees all having the same training too mean they share responsibility and are aware of their role on the team. With eLearning, particularly with a learning management system (LMS), you can track the training your employees have taken. This has two big advantages. First, through insightful reports, you know if you’re employees are up to date with their training. A particularly powerful tool if you’re delivering onboarding training or have to prove training has taken place e.g. compliance training. Tracking your training also helps you to provide better training for your employees. You can identify what they are and aren’t engaging with and you can improve your content based on these insights so that your employees get better training overall. A lack of awareness of internal weakness is a hazardous thing within an organization. Training overcomes this as you can educate your employees on important subjects that help overcome and avoid any issues. Additionally, it creates a knowledge sharing environment. Your employees learn from management and each others past mistakes and wins. This ensures that recurring mistakes are reduced and your employees know the strategies for success. Perhaps the most impactful aspect of employee training is its effect on your business’s growth. Simply put, better-trained employees make more productive team members that serve your customers better. Happier customers stick around and buy more. This can powerfully fuel your business’s growth. With such great results, it’s essential you start your employee training strategy. Read how to get started in our guide to employee training today. 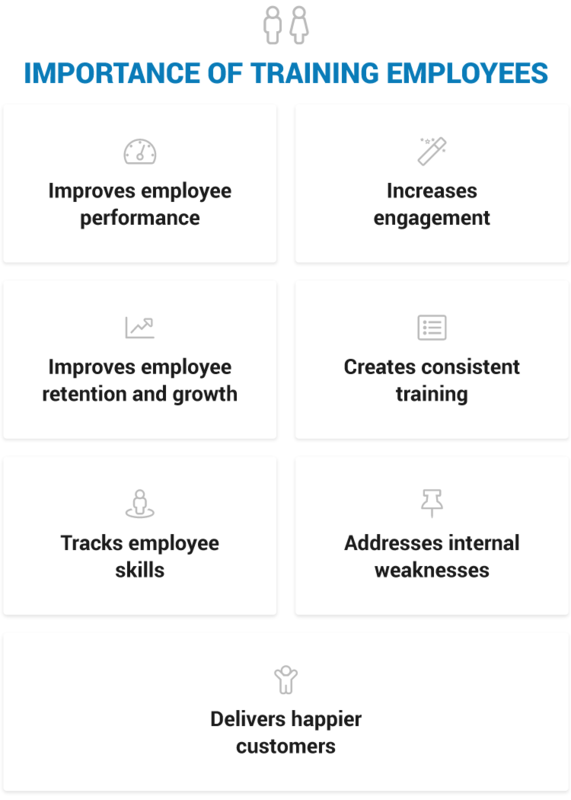 Train your employees, partners, and customers with LearnUpon. The powerful learning management system that has the features and knowledgeable team you need to achieve training success.